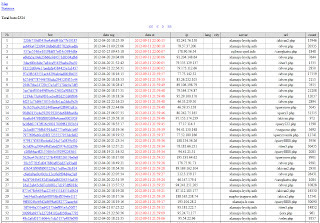 The 3 .dat files are PHP sourcecode files from the "Zemra DDoS Bot". Maybe they were modified and then reused for own Bot. I compared the files to the leaked version of Zemra DDoS Bot and they look slightly different. Also I don't see any other PHP files of Zemra DDos Bot, thus my assumption. "<date> <time> <Window Caption> <File Path of Program>"
Obviously these files were created and uploaded from the botnet zombies. What also immediately catches someone's eye is the fact that all data is cyrillic. This indicates the botnet only operates in Russian Federation and neighboring states. The image files show a young girl with long black hair and white skin. The Word document is a résumé from a russian speaking girl, maybe the same as we see in the pictures. I haven't analyzed the PE files in detail yet, but some of them seem legit programs while other clearly are malicious. IP Location: Russian Federation - Russian Federation - Olborg Ltd.
Domain Status: Registered And Active Website"
As you can see on DNS register "Olborg Ltd." owns two other IP addresses (91.233.244.103, 91.233.244.106) with additional domain names, but that's not part of this analysis. 1) top-level domains ".com" + "info"
If we take a look at the directory listing of the ".in" unit we again see some PHP files, a "mpk" subfolder (empty) and a "k" subfolder. The "k" subfolder contains also some PHP files, the Botnet binary "telnet.exe", a subfolder named "mpk" (empty) and a subfolder which contains information of every Bot ("data"). The Bots payload (telnet.exe) is still being spread, so the numbers may increase in future. What's interesting is the current status of the Bots. If we take a look into the sourcecode of the file "bn_enum.php" we can see if the IP is in red it means the Bot contacted the server less than 10 minutes ago, if gray the contact time is longer than 1 hour and black means the time in between. 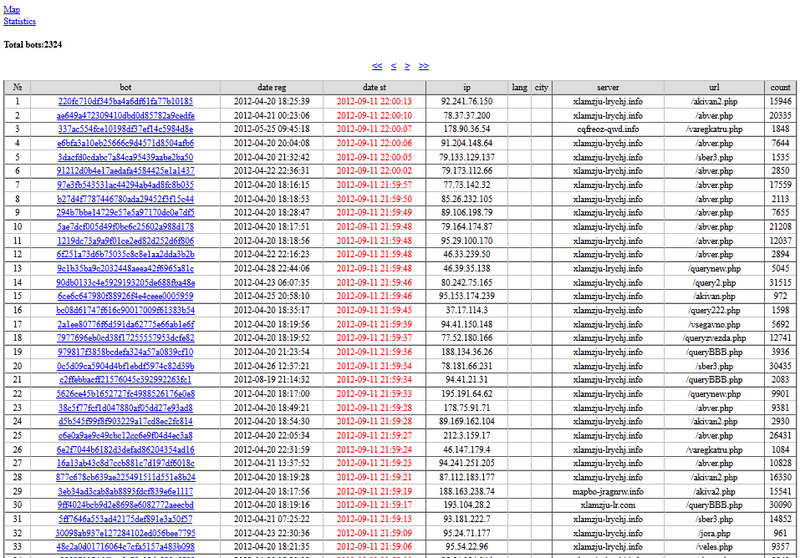 So we see this botnet or part of it is still alive. The table on the right side shows the logged data (Window caption, keylogged data) as described at the beginning (see folder "mpk1"), anyway the links don't work anymore. That's all on the server side. What is a bit strange is the server 91.233.244.102 looks orphaned, because we learned from Part 1 of this analysis that the PHP Scripts aren't responding properly. If we take a look at the other domain names (the ones without a "-"), except 2 of them all other show a blank page. The 2 domain names I refer two show me the string "ZEUS SINKHOLE" (http://ylbaugjnfutivfupbojcybabmrax.com and http://hhmsobscuoxgqwkhtugpnr.com), thus indicating they were used for infamous "Zeus Bot" and are now under control of AV guys. In the meantime Dr.Web sinkholed the domains I posted above. Thanks for not informing me at least! Now the domains I posted above respond with HTTP status code "404 Not Found". Also the two "ZEUS SINKHOLE" domains show a blank page. It seems Dr.Web cleaned up their operations on this server. Thanks to Jack Simin for pointing that out! \o/ Part 2 is the Cherry on top of the Cake ! Nice article. How can i contact with you?